The Eco Air ECO20LDT Dehumidifier is the more powerful of two units in the "T" range of Eco Air dehumidifiers. Very similar in appearance to the ECO12LDT the ECO20LDT is a larger appliance, incorporating more powerful components to provide 20 litres per day of water extraction capacity. Despite its larger size the ECO20LDT is a relatively small and light dehumidifier suitable for a smaller home or a large room of up to 30m2 (approx. 320 sq ft). The Eco Air ECO20LDT is a relatively inexpensive unit and lacks some of the refinements of higher priced dehumidifiers but is a capable machine if used in an area of the home for which it is suitable. The Eco Air ECO20LDT Dehumidifier is capable of removing up to 20 litres of moisture from the air every 24 hours. The rate at which a dehumidifier extracts water is dependent on two factors; ambient temperature and relative humidity. If either one or both of these falls the amount of water pulled from the air falls too, and the difference can be quite dramatic. The 20 litre figure quoted for the ECO20LDT was obtained at a temperature of 30°C and at 80% relative humidity. These are conditions at which most dehumidifiers sold in the UK are quoted and are useful for comparing one dehumidifier with another. They are not a reliable indication of the actual amount of water that will have to emptied from the water collection container in practice. The container in this unit has a capacity of 3 litres so would need to be emptied six or seven times per day if the unit was collecting 20 litres. Realistically the actual amount of water collected on a day to day basis will be well under half the stated 20 litres. If you are emptying the container twice every day the dehumidifier is working properly. The Eco Air ECO20LDT Dehumidifier is stated by the manufacturer to be suitable for an area of up to 30m2, which for those of us, like me, who still think in "old money" is about 320 sq ft. This is about the size of a typical living room/dining room running from the front to the back of a three bedroom house. For such a room or, for example, a large master bedroom with an en suite bathroom or a one bedroom flat, this dehumidifier will be perfectly suitable. It is not, however, sufficiently powerful for an entire house. To be effective a dehumidifier must be capable of maintaining relative humidity at a level of around 50%. It must also be able to do so without running continuously. 50% is the "magic number" because at this level the occupants of the home will feel comfortable, there should be no serious condensation problems, mold will not grow and the allergen producing dust mites will be under control. The Eco Air ECO20LDT Dehumidifier incorporates an adjustable humidistat with which the desired level of relative humidity may be set. If the dehumidifier is powerful enough for the area in which it is working it should cycle on and off to maintain that level, controlled by the humidistat. The ECO20LDT is a relatively inexpensive machine and it would be reasonable to assume that the quality of the humidistat is in line with the cost of the unit as a whole. It may be a wise precaution to invest in a hygrometer (a device for measuring relative humidity) of reasonable quality to monitor the humidity level independently and adjust the dehumidifier to ensure that the 50% level, or whatever other level is chosen, is maintained. Reviews of this unit are sparse and if the humidistat is entirely accurate this caution may be unwarranted. The unit is pleasingly compact with overall dimensions of 38 x 30 x 48 centimetres. This is helpful if the unit has to be sited in a crowded area of the room and may be particularly useful in a small apartment. The Eco Air ECO20LDT dehumidifier is genuinely portable, has a top-mounted carrying handle and weighs just 13.5 Kg, the weight of a small child of say, two to three years of age. The Eco Air ECO20LDT Dehumidifier is simple to operate and will appeal to those who find modern electrical appliances confusing with their bewildering array of options and "modes". If you have a poor memory and may forget to empty the water collection container the unit is designed so that a small bore plastic drain hose can be run to a convenient outlet to provide continuous drainage. The water flows under the force of gravity so raising the unit two or three feet from the floor may help the process. If you decide not to use the drain hose the dehumidifier will not leave a wet patch on the carpet if you fail to empty the bucket. An automatic shut off turns off the unit when the bucket is full. A power cut is not a problem either as the machine has an auto-restart feature which will switch it back on. If you are looking for a dehumidifier for your garage, unheated cellar or any other area where temperatures may fall to a few degrees above freezing for days at a time this is not the unit we would recommend. The operating temperature range is stated as from 5°C to 35°C but this is not a unit suited for continuous low temperature operation. Ice formation on the cold coil is a problem for all refrigerant dehumidifiers which makes them largely ineffective at lower temperatures. This can be countered by a system for actively melting the ice which is only available on more expensive dehumidifiers. When ice forms inside this unit it simply stops until the ice melts and if the temperature remains very low for long periods it will be stopped for longer than it is operating. The ECO20LDT Dehumidifier has a noise level of 50dB when operating. This is neither exceptionally noisy nor exceptionally quiet for a dehumidifier of this size. 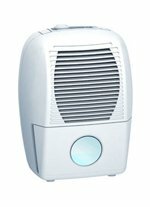 All dehumidifiers, with a fan, are noisy although some are less noisy than others. In case you are wondering, dehumidifiers without a fan are only effective in very confined areas, such as a closet so, for our purposes here all dehumidifiers are noisy. In summary, this is a perfectly sound choice of dehumidifier for use in living areas of the home up to 30m2. It lacks some of the "bells and whistles" of its more expensive rivals but for those on a restricted budget it represents good value for money.